OK, the list runs to well over 50, but it's pretty hard to stop once you get started. For a leisurely row on the river, you can hire a rowboat from one of the two boatsheds in Studley Park. There are also numbers of fine dining establishments around Melbourne that can produce an intimate romantic atmosphere and maybe a log fire. For a truly Melbourne romantic experience there is the Colonial Tramcar Restauant. 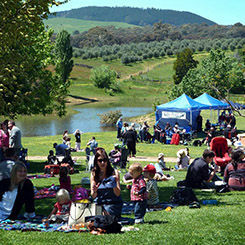 And if you are able to get out of town, there are many options which can be found on our pages about country Victoria. Dinner in a restaurant at a winery, an overnight stay in the Dandenongs, a romantic weekend at Queenscliffe can all be recommended. And the next morning you can always turn up for breakfast at 6am at the Vic Market in your dinner suit and party frock. You are likely to find a few similar couples doing the same. Watch the sun set over St Kilda Beach - Sit on the sand, the grass or a bench. You can wander along the beach and out onto the pier and have a glass of wine at the pier kiosk (once it is rebuilt) . There are also several restaurants and cafes on the beachfront at St Kilda which can provide a great view of the sunset. Enjoy champagne and a romantic picnic under the stars while listening to a concert at the Sidney Myer Music Bowl. During summer there are numbers of classical concerts as well as ballet and opera at Melbourne's iconic open air venue - and many of them are free. For a listing see The White Hat Guide to the Sidney Myer Music Bowl. If you prefer a bit more hustle and bustle, you can be in the thick of the action dining on the footpath in Lygon Street. You can find more information on Melbourne's Italian precinct at The White Hat Guide to Lygon Street. Wander through a private garden - Most weekends in Melbourne you will find that some family has thrown open to the public their lovingly tended private garden for some good cause or other. You can find a listing of current private garden openings at The White Hat Guide to Private Gardens in Melbourne. Go cycling. Melbourne is relatively flat and if you don't have your own bicycles you can always hire them. A particularly romantic ride is from the city to Williamstown and back which involves a punt crossing across the Yarra River underneath West Gate Bridge. You may want to hire a tandem (click on link to right) but White Hat suggests that if you feel your back view is not your most attractive angle that you quickly claim the rear seat. You can find more information at The White Hat Guide to Cycling in Melbourne. Visit a night market. On many days in Melbourne there are atmospheric night markets. During summer there is usually a night market at the Queen Victoria Market on a Wednesday, ones at Northcote Town Hall and St Kilda Beach on a Thursday and one at the Abbotsford Convent on a Friday. You can wander around hand in hand checking out the merchandise, possibly enjoy a meal on the grass and listen to a band - all with no price of admissions. You can find a comprehensive listing at The White Hat Guide to Twilight & Night Markets in Melbourne. For as long as most people can remember, afternoon tea at The Hotel Windsor has been a Melbourne institution. A full leisurely afternoon tea served in the luxurious surrounds of Melbourne's of Melbourne grand old historic hotel really calls for a lady to wear a hat and gloves. If you don't have a hat and gloves and the gentleman doesn't have a cane then White Hat urges you to at least carry yourself with a dignified air. If the weather is fine, a picnic in one of the many parks and gardens with a bottle of champagne is hard to match. The Botanic Gardens in particular evokes the atmosphere of a Jane Austin novel. Keep in mind, however, that Melbourne's weather may require a Plan B. Go sailing. Towards the end of this list you will find details for trying out sailing for free. Obviously you need to dress appropriately. However if you feel that you look at your best in a wet t-shirt then White Hat suggests you contrive an occasion to fall overboard. For those who prefer the romantic experience of sailing without all that sweaty physical exertion we have listed some options below which you may wish to check out. Visit one of Melbourne's Hidden Gems. Most weeks in our White Hat Melbourne Newsletter we mention a hidden gem and many of these are romantic in nature. Ride a tram - You can ride the City Circle Tram for free, but once you've done a complete circuit you probably don't want to go around a second time. On the other hand you could choose a particular tram and ride it to the end of the route and back. On the weekends, if you buy the right ticket, this will cost you next to nothing. and for visitors it can be a good way to get a flavour of Melbourne suburban living. You could for instance try the route 109 which runs through Collins Street in the city. If you are on a tight budget you could break your journey at either Victoria Street Richmond or the Box Hill terminus and enjoy a cheap warming Asian meal. If you have a little more to spend you could enjoy a meal at one of the restaurants overlooking the bay at the Station Pier terminus. Have a meal on the tramcar restaurant - Enjoy a leisurely meal in a heated tramcar restaurant while looking through the windows at the poor mugs out there walking around in the rain. Be warned that the wine (included in the price) keeps on coming so you're sure to feel nice and warm when you return to base. Take a romantic evening stroll along the Paris end of Collins Street then into the Treasury Gardens. You can find some background information on this area in Part 2 of our podcast of August 2008. Take the ferry to Willy. Williamstown (or Willy as the locals call it) still has a village atmosphere and the boat trip across the bay helps put you in a romantic mood. There are numbers of cafes, restaurants and pubs along the waterfront for a romantic meal. More details at The White Hat Guide to Williamstown. Spend a lazy afternoon in the sun at a rooftop bar such as the one on top of Curtin House. Lie on the grass at an outdoor cinema. Popular outdoor movies in Melbourne include the Moonlight Cinema at the Royal Botanic Gardens. As part of Australia Day, citizens and visitors are invited to visit Government House, inspect many rooms not normally open to the public and enjoy a picnic on the lawns. Music and entertainment throughout the day. Lavandula's La Primavera festival honours the original Swiss-Italian migrants who celebrated the coming of spring with song and dance. Rosa Voto and her troupe from the Melbourne School of Tarantella will be performing their intoxicating songs and dances. Salvatore, will share the stories of his homeland through song. Lina and Tony of Rose Creek Estate will be showcasing their quality range of Italian-style wines, olive oil and preserved olives. Mara Ripani of Village Dreaming will be putting on a special performance called Kitchen Songs. Descendants of the original Swiss-Italian family who once farmed the property, Faye and Boyd Thompson will give an authentic tour of the original farmhouse. In addition, good regional fare will be available from La Trattoria and its wood-fired oven. Several stallholders will be showcasing their wares and handicrafts. The Moonee Valley Festival comes to an end in great style with a full day of food, art and entertainment in a grand cultural celebration. There will be live music, roving performances and pop-up activities for all ages! There's plenty on offer for kids with ‘Beasties’ interactive show, the True Fairies storytelling, hula workshops and roving entertainers all afternoon. The celebration will continue into the evening with the talented Djirri Djirri Dance Group who will use dance as an interpretation of their culture to share stories about creation, family and Country. Enjoy the sculptural lanterns of Lantasia by illustrator/designer Tyson Savanah, laser lights, projection art and pyrotechnics as the 2019 Moonee Valley Festival in closes in style. Join the Diggers Club team for a weekend of heritage apple festivities and celebrations. Taste test and choose the best heritage apples and pears, sample freshly pressed apple juice and cider, taste and buy delicious baked apple pies and strudels. For the green thumbs join garden tours and learn about the history and making of this beautiful garden and pick-up gardening tips at the free gardening workshops. Book into an Apple Masterclass with the heritage apple experts, Pete the Permie and David Key and sample cider from local makers. Learn all about cider making at the demonstrations. Listen to live music at the Fork to Fork Café while you enjoy a menu inspired by the autumn harvest and complimented by wine. Following the success of their 2017 debut Australian tour and direct from London, Puttin’ On the Ritz is returning to Australia this May and June. Come and enjoy the all-singing, all-dancing celebration of some of the most iconic music of all time. With glittering costumes, the cast of energetic dancers and multi-talented vocalists will provide a glamorous night out. Full details about individual shows and bookings at Melbourne International Comedy Festival. The Piers Festival is held at Princes Pier, Port Melbourne during Victoria’s Term 1 school holidays. 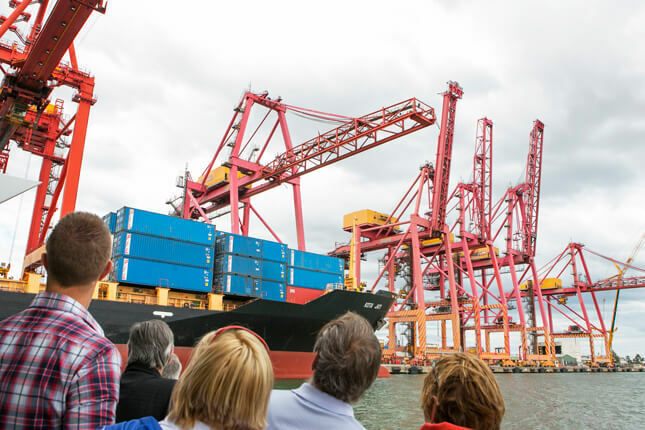 Piers Festival celebrates and reflects on the collective historical and contemporary migration stories at its site, Princes Pier, the significant entry point where almost half of Australia’s post World War II refugees arrived. The Festival brings to life the pivotal role Princes Pier played from 1915 to 1969 in Victoria’s growth and as a gateway to the diversity of cultures that enrich our community. With 12,000 attendees in 2015, Piers Festival has grown to become an annual fixture in Victoria’s cultural calendar and a significant occasion to acknowledge and bring to light our Indigenous and multicultural talent. The Cruise Ship Crystal Symphony visiting Melbourne. ..
Come and jam to the music of Django Reinhart, or just have a listen. If you would like to come along and jam, contact Misja on carbowalker@optusnet.com.au .. The popular annual horse racing event. ..